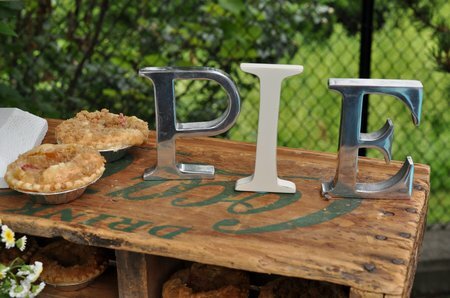 This weekend for Father’s Day we made pie, lots and lots of pie, and set up a fun Pie Stand for our family celebration. I think it just might have been one of my best ideas ever. 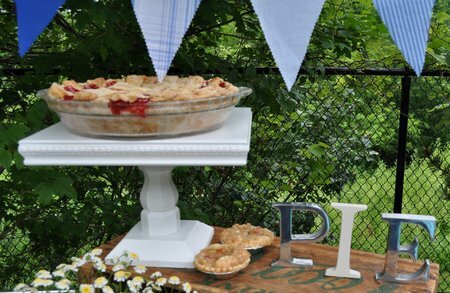 😉 This pie dessert table would also be amazing at a wedding, or birthday. It was inspired by my sweet husbands love of pie. 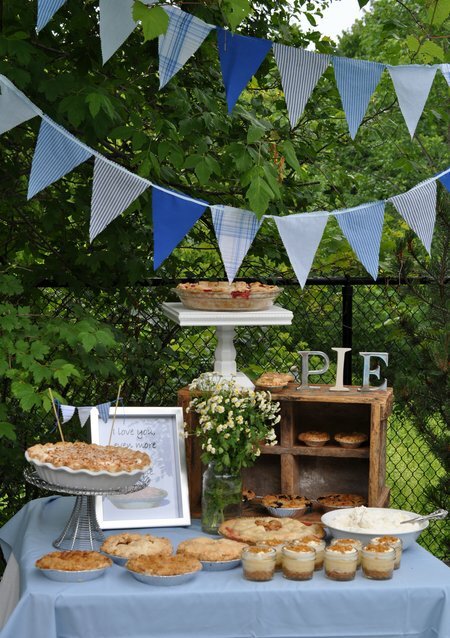 I set up the pie stand under some nice trees in the backyard. I used the blue bunting I made last Father’s Day out of old men’s shirts over the stand. See how I made it here. I used the different shades of blue as the colour scheme -which seemed really fitting for Father’s Day. 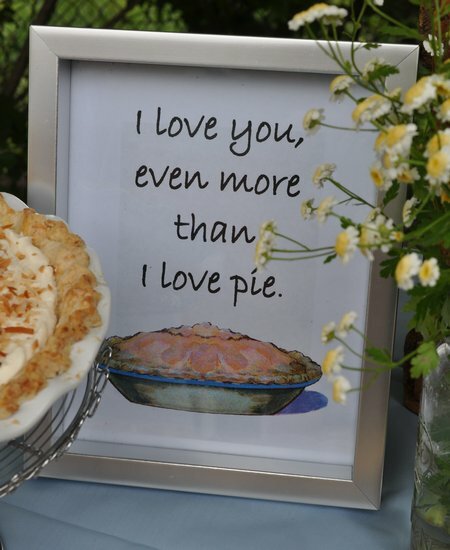 Another fun addition to the table was this cute “I love you even more than I love pie” sign. I spelled out the word “pie” from some letters I had around the house. 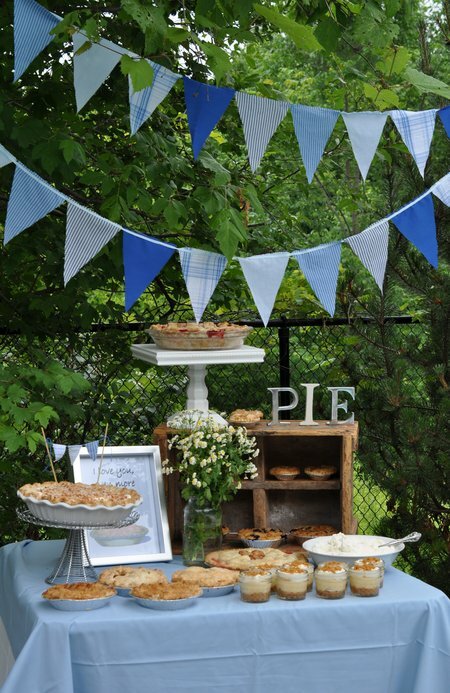 An old crate worked really well to create height on the table and hold some mini pies and tarts. Here are some blueberry crumble, and some rhubarb custard tarts. It was great to have a variety of sizes from full pies all the way down to tarts. 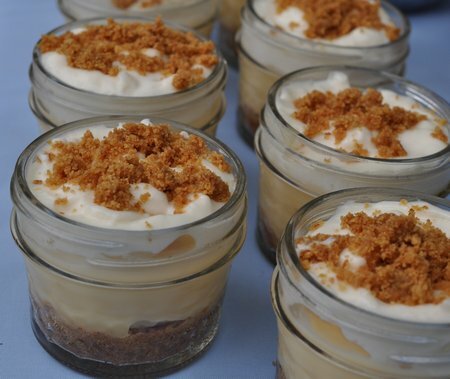 The banana cream pie in a mason jar also turned out really well. 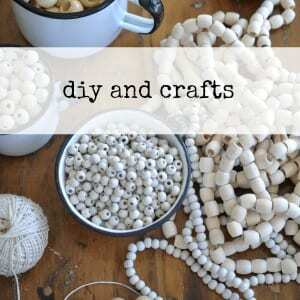 They were quite easy to make, and looked so cute in their individual jars. 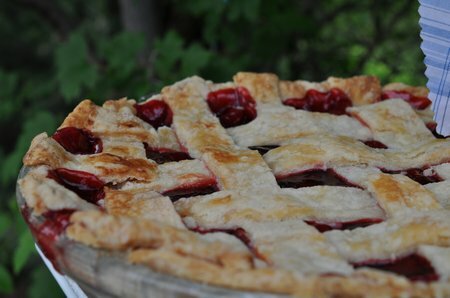 My favourite pie was the cherry pie. Displayed on one of our homemade cake stands -see how they were made here, and repainted white. 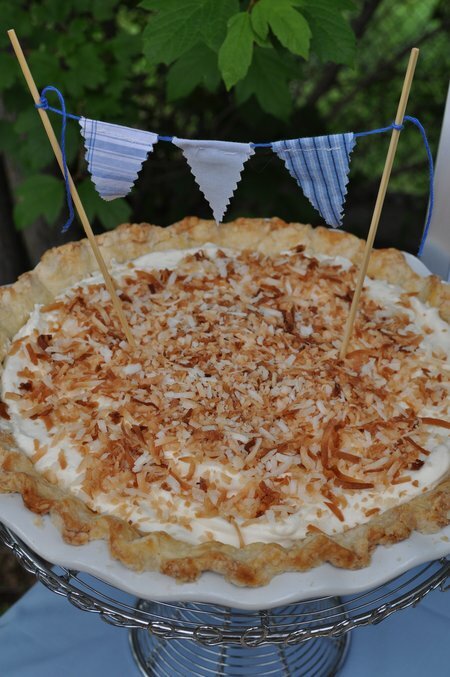 And, my husband’s favourite, coconut cream, with a sweet little mini bunting made with a little embroidery thread. My daughters made the mini apple pies, some with double crust, and some with crumble. The middle pie is strawberry rhubarb. This one and the rhubarb custard tarts were made by my sweet sister-in-law Heather -thanks for catching the vision Heather! We had vanilla whipped cream and vanilla ice cream to top off the pies. 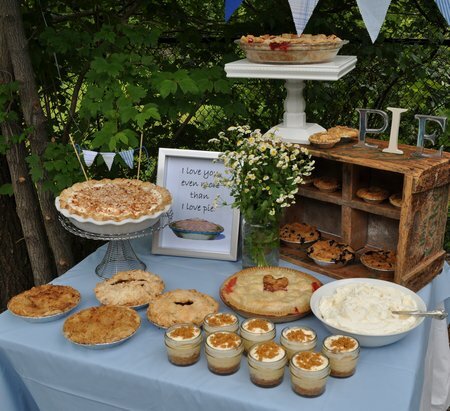 We sampled them all, and divided up the left overs, making for sweet memories of the pie stand for days! 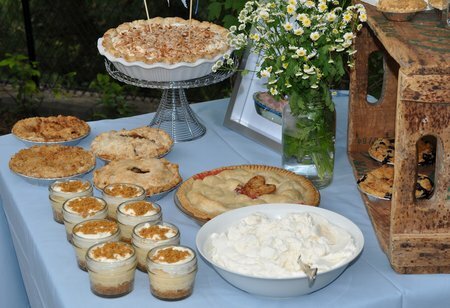 Pie equals a party, lots of pie equals an AMAZING party! May there be some pie in your immediate future my friends! Life is a party -a pie party. 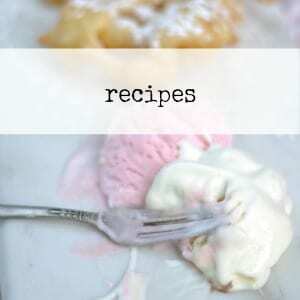 See all the recipes for the pies in the post “The Pie Stand -Recipes”. 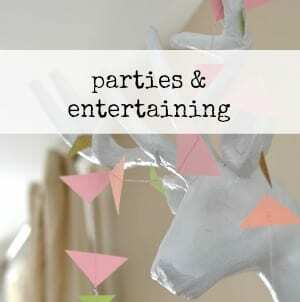 This post is linked up at Between Naps on the Porch, The 36th Avenue, The Shabby Creek Cottage, Common Ground, House of Hepworths, Rooted in Thyme, The Vintage Farm House, The French Country Cottage, Whipperberry and Tatertots and Jello. That is totally precious! There are so many things that I love about it. 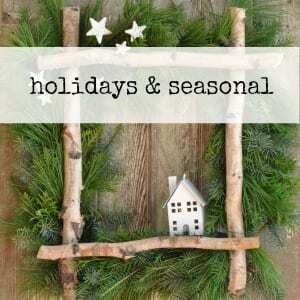 . . the little pies in Mason jars, the little bunting on the pie, the recycled shirt bunting! I am going to give that a try! I am partying with you at the Shabby Creek! Oh my gosh I love this idea! Who does not love pie?? 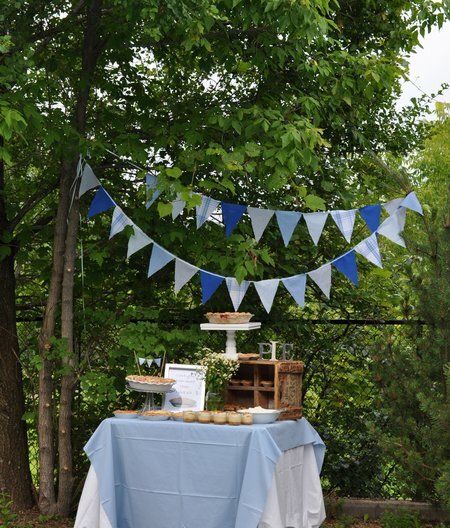 The bunting is super cute what a great idea to celebrate dad’s day! Oh, what fun!!! I, too, adore pie and this is THE BEST IDEA …EVER!!! Your pie stand is fabulous! 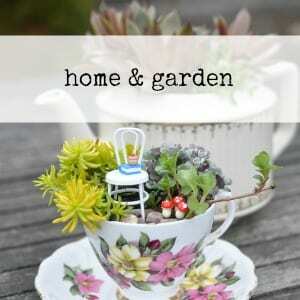 I love this idea including your use of an old crate. The pies look scrumptious. So cute and each pie looks absolutely delicious!!!!!! This is positively delightful! They all look delicious and the bunting is darling, too! This is so cute! OK I am ready for vanilla ice cream and pie! They all looks so good! This is adorable and everything looks so delicious. This is too cute!! Who’ve the sign, the setting, the idea and the pies!! Nice!! How fun, this is adorable and looks like a magazine shoot. 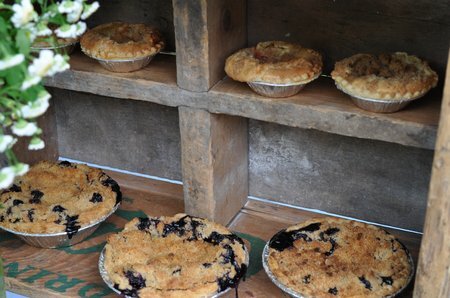 AND those pies look scrumptious!! wonderful idea. I loved the lil sign about loving you more than pie. Very creative and looks like tons of fun to me. I think I might be a missionary of celebration………..or fun too! want to have a dessert party soon. What a fun idea! Thanks for sharing on Simple & Sweet Fridays. Hi Dannyelle, Congrats on being featured on Simple & Sweet Fridays. Such a fun party for Father’s Day. Don’t forget to grab a button for being featured. Have a great week!